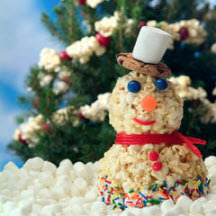 You and the kids will have fun making, decorating and eating these whimsical marshmallow popcorn snowmen. Decorations: sprinkles, licorice, gum drops, cinnamon candies, etc. Melt marshmallows and butter in a large saucepan. Decorate as desired. Have fun! Makes 10 popcorn balls; 5 snowmen (2 balls each).